I am so pleased to see this story online and sharing space with other great works by Michael Pagan and Kenneth Pobo. The acceptance for “Letters…” came the very same week as my acceptance from Neon for “Crash & Fly.” It was quite a week! Isn’t it funny how you can wallow in the slush pile and then strike the right editor(s) at the right time(s)? A week of acceptance was a nice way to kick off 2012. . Speaking of Neon, editor Krishan Coupland was kind enough to interview me about my story “Crash & Fly.” Here is a link to the interview where I talk about my strange obsession with plane crashes and how this story came to be written in index form. 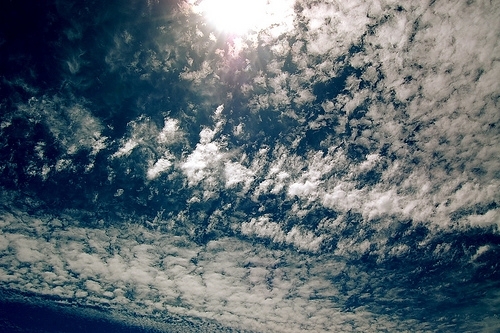 When I searched the title of my story on flickr.com this beautiful sky picture was what a found. I’m not sure what it has to do with high school boyfriends or letters, but I love the expansive feel of it. It matches my mood today. How are you feeling today? What is the best week you’ve ever had?